The November-December 2013 issue of Art World News reports that Schneider Rothman Intellectual Property Group has sued three major companies on behalf of the representative of work by painter Alexei Butirskly. The publication says that Thomas Charles Editions filed a copyright infringement lawsuit against Getty Images, Yankee Candle and Bed Bath & Beyond. The lawsuit claims that Butirskily’s painting “Autumn Leaves” was used without permission to adorn a Yankee Candle. More details are available here. 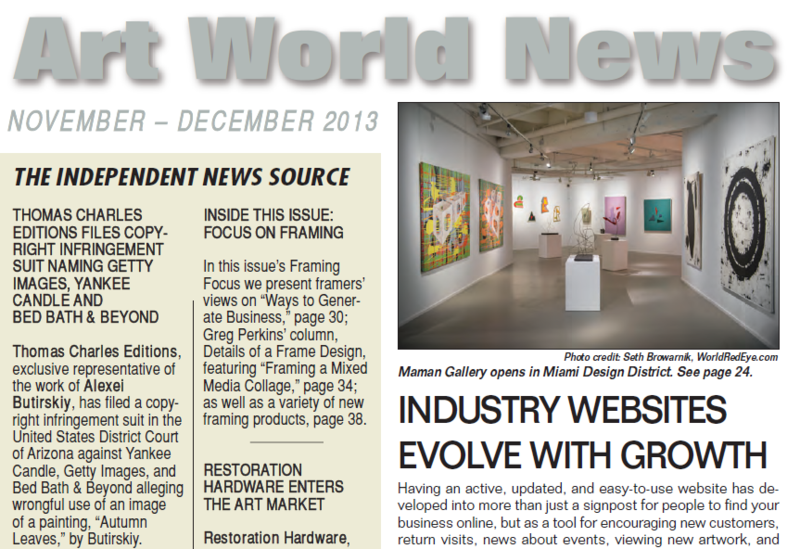 Art World News circulates to about 13,000 subscribers who follow professional art.